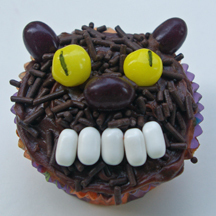 The yellow eyes and menacing teeth are the finishing touches on this creepy and cute furry werewolf cupcake. What You Need: 1 cupcake; chocolate frosting; chocolate sprinkles; 2 Lemonhead candies; 3 black jellybeans; 5 white Tic Tacs; black food-safe marker. How to Make It: Frost cupcake. Immediately sprinkle with chocolate sprinkles (they stick best if you do it right away). Use food-safe marker to draw on yellow eyeballs. Add jellybean nose and ears. Finish with white Tic Tac teeth!